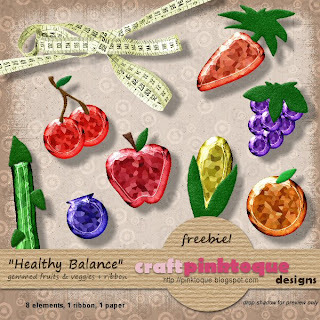 For today's freebie I have part 1 of 2 of a new series I call "Healthy Balance." Recently I was turned on to MyFitnessPal and I *love* the site. I was looking for a free food diary to use so I could keep track of my meals for digestive reasons and I've been wanting to get in better shape so I joined up and can't get over what a difference it has made in only 5 days! It's a really powerful thing to track your food intake and see how many calories or fat or sodium you're consuming. It's definitely helped me to make some healthier choices this week and stick to my goals. And wow is it motivating to keep on going and stay on track! The community is so helpful, inspiring and supportive -- it's like a little family :) Anyway, the theme for this week is tribute to a "Healthy Balance!" This little mini kit contains 8 gemmed fruits and veggies: an asparagus, blueberry, some cherries, an apple, corn, grapes, an orange and carrot. It also contains one paper and one measurement tape ribbon/bow (a cu item courtesy of Kirsty Smith that was recoloured to be similar to the measurement tape I have :D ... thanks, Kirsty!) This is part 1 of 2 like I already mentioned... next Friday I have an addition to part 1 that will include some other healthy goodies in the theme and some more paper :) It's the perfect little mini kit to enhance digital scrapbook pages displaying your own healthy choices and improvements because those successes should be scrapped about! Thank you! Your blog post will be advertised on the DigiFree Digital Scrapbooking Freebie search engine today (look for timestamp: 23 Aug [LA 01:41am, NY 03:41am, UK 08:41am, OZ 06:41pm] ). Thanks again, Kirsty -- your bow was the perfect added touch to the theme :) I love it!